There’s never been a more magical land in the history of mankind, such as Transylvania. Secluded for centuries, wrapped in myths and legends, but never fully disclosing itself, cocooning fantastic beings that only the moon might know the name of. A universe dormant for the tribe of men but alive as the wind through the leaves. That only few moons ago decided to reveal itself to the rest of the world, when a mighty wizard, traveling through space and time, opened the Transylvanian gates for the first time, on a summer eve, releasing its magic for four days and nights, to all those travelling the land, from afar. That is when the Untold legend began, bound to reappear every year, in the same night, each time revealing more of its fantastical universe. A world of wondrous diversity, under the ruling of the Wizard and it’s loyal servant, a legendary dragon, summoned from the stars and bearer of Truth. A realm where oracles and time weavers are changing the laws of Time, where druids and part animal-part plant beings are protecting the forests. And Elderly teachers and their alchemist students are continuously transforming elements. Where ancient celestial beings, inventors and architects, are searching for knowledge beyond stars. And nature priests, surrounded by nymphs, mythical chimeras and nature spirits live in a perpetual connection. And above all, pledging themselves to the mighty wizard, a tribe of men-wolves, warriors of regal kin, offering their protection to the land beyond the forest. Each year, for those four days and nights, the Transylvanian land, enriched with more and more magic, opens its magical gates to all those thirsty to know its secrets. Welcome to Untold! Untold, the biggest electronic music festival in Romania, has already sold 15,000 passes for its 2018 edition, in just a few minutes. The tickets had a special price of RON 400 (EUR 86). The organizers have announced the dates for the 2018 edition, but none of the artists in the lineup. “The first 15,000 subscriptions for the Untold 2018 were sold on Tuesday, in the first few minutes after putting them up for sale. Although we initially announced that only 10,000 passes will be on sale, at 14:00 when the sales began, tens of thousands of fans were waiting to secure their place for the fourth chapter of Untold. That’s why we decided to increase the number of subscriptions, so in just a few minutes, 15,000 subscriptions reached the festival’s biggest fans at a special price of RON 400,” said Ioana Chifor, PR manager Untold, cited by local Mediafax. The Untold fans will have yet another chance of buying passes for the 2018 edition during another similar sales event to be organized at a date that is yet to be announced. 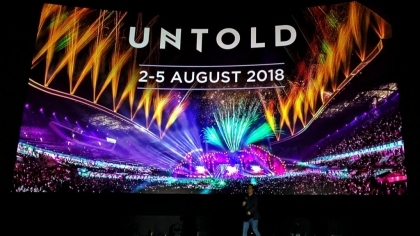 Untold 2018 will take place between August 2 and August 5 in Cluj-Napoca. More than 250 artists are expected at the event, a higher number than at this year’s edition, the organizers said.